DESCRIPTION: "Burnt Circuits Kept Under My Bed" is 5th volume of Under My Bed compilations series; this collection of provides a snapshot in time of the ever expanding in number and qualities of, mainly, italian electro-acoustic and electronic scene. 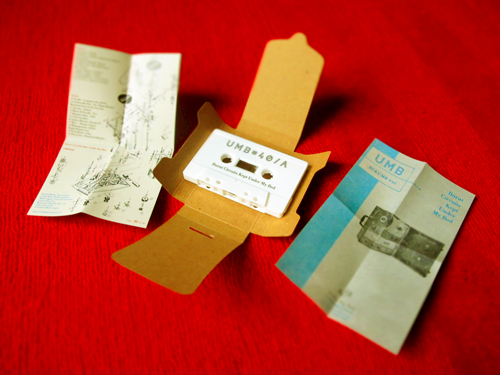 As in UMB tradition most projects involve minimalistic, DIY, Lo-fi, home-recorded deviated pieces. Features: 1Erore, Deison, Stefano DePonti, Fabio Orsi, Luca Sigurta', Matteo Uggeri, Spring Makers, Von Tesla, st.ride, Architeuthis Rex, Apoteke, Marta DePascalis, Maurizio Abate, Carlo Giordani & Andrea Marutti, Mace., Metzengerstein + IOIOI, Tettu Mortu, Deep Grass. Limited edition of 90 copies on K7, packed in an heavy recycled cardboard folder, ink stamped graphics, artwork by M. Uggeri inspired by the user manual of the Ampex 601, portable two-track recorder. UMB#40 / teaser II from Stefano De Ponti on Vimeo.